UDM Downloads > Web Gallery Wizard! 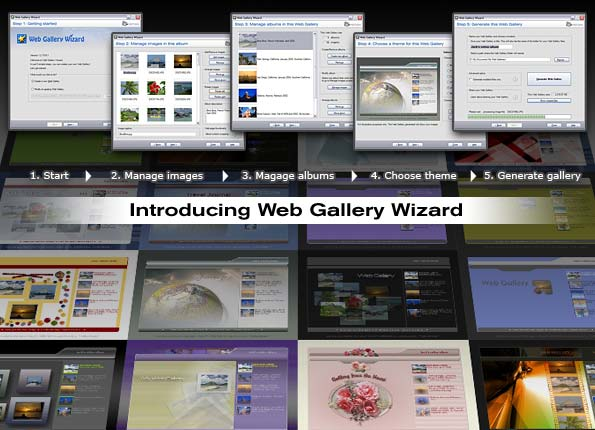 Web Gallery Wizard (standard and PRO versions) is the essential tool for anyone who wants to create photo album web pages, quickly and easily, with professional results. Showcase your images by creating your own personal website; no HTML knowledge required. In 5 simple steps the wizard generates your Web gallery, including thumbnails, ready for posting online to any Web host. Arrange photos into albums, write image captions and album descriptions, select from several built-in professionally designed themes, with more available online. Web galleries feature animated intros, slide show, QuickView navigation (see photos & thumbnails at-a-glance, in one window), high-resolution image option for printing. The Web gallery project file resides on your computer so you can easily update your online photo album without starting from scratch. Note: Unlike the PRO, this version displays a promotional message and does not have integrated FTP upload.